I have a need for a large number of 24 ft wooden skeleton log cars for my future layout. I think mine is too high, though the couplers are at perfect height. The test car works well as long as it has metal wheels. I have scale CAD of the design but still think the cross bar is too high since it is at rail level on the caboose. Anybody want to weigh in? Carve the notches in the middle. Adds a little extra detail and matches the O prototype. Use something like stiff copper wire or even guitar string yo make those little railings, as it adds extra detail to make it look even better! You can use small dabs of hot or white glue to make the bolt heads. Just paint over it when dry. Try to get the middle beam as low as you can in height to what you think looks good, or by screwing the trucks into the top beam, not the center one if possible. Trying to build a jig for cutting/carving the notches but I have inconsistent results to date. I have 17 more months to perfect the design and complete production! You're working really hard but I'm not entirely sure why. There are also similar short flatcars. I supplied the Climax drawings to Alan Curtis when he did the first design of these; a rather similar, even shorter, car was made by Quality Craft back in the 70's, and sold to Gloor Craft, that is also out of business. They are now out of business but the cars are still around in shows and really old stock. VERY similar to the N Scale Kits cars. I've expirimented successfully with using the MT 'civil war' link and pin coupler boxes on these as well, as you can see in the photos, that was SOP in the east. Note that you can now get a Barnhart loader on Shapeways, it's very good. 'Note that you can now get a Barnhart loader on Shapeways, it's very good"
Not finding the loader on Shapeways. Any link would be appriciated! EDIT: Found it!. I was planning to kit-bash this loader for my yard unloader. I was also planning on using a spar loader with a steam donkey in my logging areas. You are also correct that the McGiffert loader would be a very cool option. Your original statement about no one scratch builds cars is not quite true. You didn't look far enough! Awesome! Love the pickle vats. If you need, let me know and I may be able to make something for you on a sprue that you can add your own wheels to go with the loader. Just seen this post. Here is the loader you asked for. 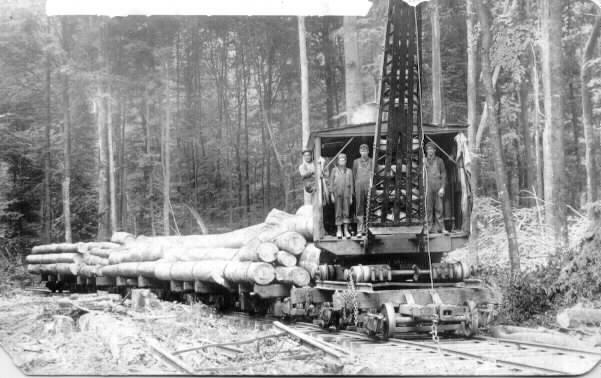 Also, here are some logging cars for you. The logging car uses the Generic trucks that come on Uses Bachmann N Scale PLE 43221 rolling stock. That is all I had to design off of at the moment. The cool thing is you can get these in stainless steel if you order two at this link. Those are the ones we talked about in Private messages buddy. If I can help further let me know. I did not give up but it has taken me a while. Material supply has been an issue in India. The first twelve are assembled. lots of tweeking and correcting to go but they are together and working. Next to add brake wheels to all. The worst six will get log sets and rusty chains. The best ones will be the empties. Learned a lot doing this. I learned a lot of humility as I only thought I was a good modeler. The devil is in the details. Getting a much more deft touch and purchased better optics. Thanks to everyone who has helped out on NScale.net for getting me this far. I am convinced now that this will be a long and enjoyable journey.